Numerous studies have shown that using an appropriate mouthrinse, in conjunction with regular brushing and flossing, is an easy and effective way for you to improve your overall oral health. As part of a regular program of oral hygiene, mouthrinses (which are sometimes called mouthwashes) can be effective at reducing plaque, controlling bad breath, and helping to prevent tooth decay and gum disease. There are a myriad of mouthrinses lining the drugstore shelves, and they are available in both prescription and over-the-counter (OTC) formulations. Which one is best for you? That depends on what benefit you expect to get from using it. It's important to keep in mind that many off-the-shelf mouthrinses are primarily cosmetic: That means, they may (temporarily) make your mouth taste or smell good, but they don't offer any lasting benefit to your oral health. There's nothing wrong with that — as long as you weren't expecting anything more. But if you've been told that you are at risk for tooth decay or gum disease, you'll want to use a mouthrinse that has proven clinical benefits. Mouthrinses that offer oral-health benefits are considered therapeutic. These fall into two general categories: anti-cariogenic rinses, which are designed to prevent tooth decay (and thus dental caries, or “cavities”); and anti-bacterial rinses, which help control the buildup of plaque bacteria in your mouth. Some products may even offer both types of protection. To help prevent tooth decay, anti-cariogenic mouthrinses use an ingredient you're probably already familiar with: fluoride. This is often in the form of a .05% sodium fluoride solution. 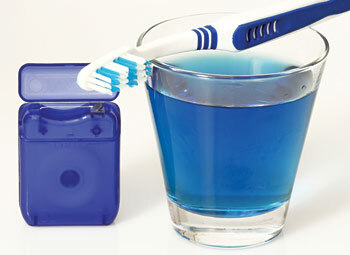 Because it's a liquid, the rinse can get all around your teeth — even into spaces the smallest brush can't reach. Fluoride has been consistently proven to strengthen tooth enamel, which protects against decay; it can even reduce tiny lesions on teeth where a cavity may form. There's hardly anyone who couldn't use some extra help in the fight against cavities — but if you've been told you may be at a higher risk for tooth decay, or if you have difficulty brushing and flossing, then an anti-cariogenic rinse is a good choice for you. Anti-bacterial mouthrinses generally contain ingredients (like triclosan, essential oils, or the prescription medication chlorhexidine) that help to control the microorganisms found in plaque. Plaque, a sticky, bacteria-laden biofilm, occurs not only on the surfaces of the teeth, but also in other parts of the mouth. Rinsing with an anti-bacterial solution has been shown to provide a greater reduction in plaque than brushing and flossing alone. As tools in the fight against gum disease (gingivitis) and tooth decay, anti-bacterial mouthrinses may be a good step toward improving your oral hygiene. If you're shopping for an over-the-counter therapeutic mouthrinse, look for the ADA (American Dental Association) seal on the label; it means that the product has been evaluated and proven effective by an independent panel of dental experts. If a mouthrinse has been prescribed for you, you should carefully follow the usage instructions. (Note, however, that due to labeling rules, prescription mouthrinses may not be eligible for the ADA seal.) Mouthrinses can benefit most people, but they generally aren't recommended for children under the age of six, who may swallow them.